Q. 1: What is the chief end of man? A. 1: To glorify God and enjoy him forever. Westminster helpful condenses the Bible’s answer to the ultimate meaning of life into one short, seven word answer. We were made to glorify and enjoy. That’s why God made us. It’s that simple. Everything in our life is somehow supposed to be ordered towards the glorification of God and our enjoyment of God. Of course, that just raises a host of other relevant questions. Assuming we buy that answer, what is God’s glory and what is it to glorify God? Why should we glorify God? And how can we glorify God? Well, it is to such questions that the great 17th Century Puritan Divine Thomas Watson turned his attention in the first proper section of his classic sermon series commenting on the catechism A Body of Practical Divinity. I picked the work up this week and I gotta be honest, this is fantastic stuff. It’s rich, careful, and learned, but because Watson is preaching, the writing is just lively! So what does Watson have to say? Well, to begin, he distinguishes the nature of God’s glory. First, there’s God’s own, internal glory, his luminous being that he possesses without any relation to anything but his own Triune life as Father, Son, and Holy Spirit. God is glorious. But second, there’s ascribed glory–the kind of glory that creatures can “give” him so to speak, through their being and actions, that reflect or acknowledge God’s glory. It’s the honor we show him. Okay, but what is it to glorify God? 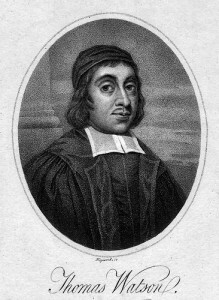 Watson says that “glorifying God consists in four things: 1: Appreciation, 2. Adoration, 3. Affection, 4. Subjection. This is the yearly rent we pay to the crown of heaven.” As we appreciate God, worship him alone, love and delight in him, as well as obey him in all things, we give him glory. Inquiring minds might persist in asking “Well, why should we?” Watson gives five reasons for that as well. First, God gives us our being. He made us. So give him glory. Second, he gave us our being so that we might glorify him. That’s the purpose written into our DNA. Third, God is actually worthy of the glory. He just is that good. Fourth, everything else from angels to anthills glorifies God, so why not humanity? Are we the only ones going to be that obtuse? Fifth, we must glorify God. It’s really our only hope in this life of any ultimate good. We glorify God by an ingenuous confession of sin…it acknowledges that he is holy and righteous, whatever he does. We glorify God by believing. Rom 4:40. ‘Abraham was strong in faith, giving glory to God.’ Unbelief affronts God, it gives him the lie; ‘he that believeth not, maketh God a liar.’ I John 5:50. But faith brings glory to God; it sets to its seal that God is true. John 3:33. We glorify God, by being tender of his glory. God’s glory is dear to him as the apple of his eye. An ingenuous child weeps to see a disgrace done to his father. Psa 69:9. ‘The reproaches of them that reproached thee are fallen upon me.’ When we hear God reproached, it is as if we were reproached; when God’s glory suffers, it is as if we suffered. This is to be tender of God’s glory. We glorify God, by being zealous for his name...Zeal is a mixed affection, a compound of love and anger; it carries forth our love to God, and our anger against sin in an intense degree. Zeal is impatient of God’s dishonour; a Christian fired with zeal, takes a dishonour done to God worse than an injury done to himself…Our Saviour Christ thus glorified his Father; he, being baptized with a spirit of zeal, drove the money-changers out of the temple. John 2:14-17. ‘The zeal of thine house has eaten me up. We glorify God, when we have an eye to God in our natural and in our civil actions. In our natural actions; in eating and drinking. I Cor 10:0I. ‘Whether therefore ye eat or drink, do all to the glory of God.’ A gracious person holds the golden bridle of temperance; he takes his meat as a medicine to heal the decays of nature, that he may be the fitter, by the strength he receives, for the service of God; he makes his food, not fuel for lust, but help to duty. In buying and selling, we do all to the glory of God…We glorify God, when we have an eye to God in all our civil and natural actions, and do nothing that may reflect any blemish on religion. We glorify God by labouring to draw others to God; by seeking to convert others, and so make them instruments of glorifying God. We should be both diamonds and loadstones; diamonds for the lustre of grace, and loadstones for attractive virtue in drawing others to Christ. We glorify God by a holy life. Though the main work of religion lies in the heart, yet our light must so shine that others may behold it…When the saints, who are called jewels, cast a sparkling lustre of holiness in the eyes of the world, then they ‘walk as Christ walked.’ I John 2:6. When they live as if they had seen the Lord with bodily eyes, and been with him upon the mount, they adorn religion, and bring revenues of glory to the crown of heaven. Watson keeps going through the many uses we can put this to as well as the various ways we can enjoy God, but this seems like quite enough material enough for now. Certainly Watson shows us that there isn’t an inch of our life, time, energies, affection, living or dying, that can’t be turned to the glory of God. So what are you waiting for? Get to glorifying!